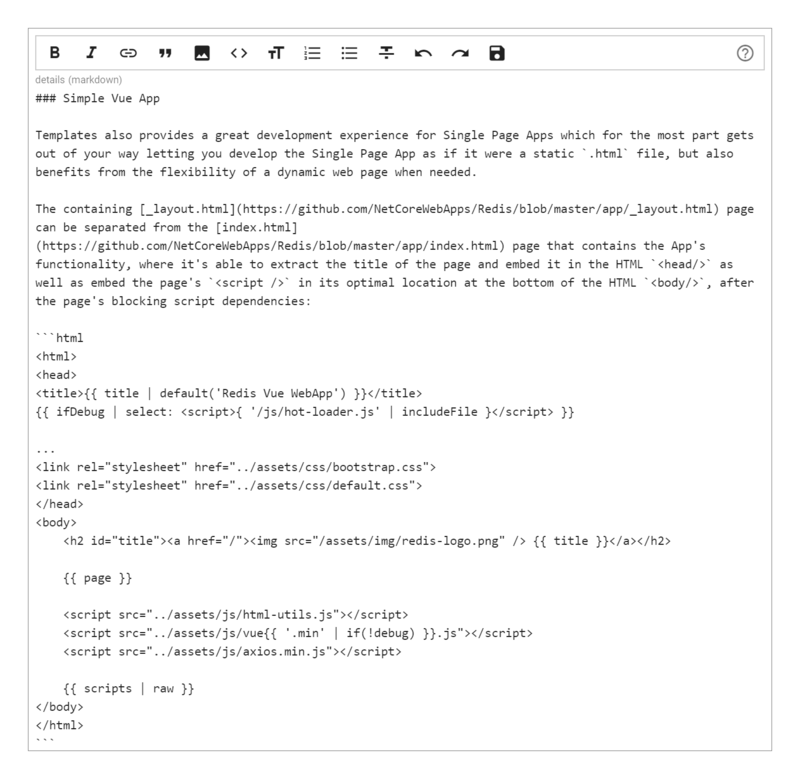 To make contributing ServiceStack Community content as pleasant as possible we’ve developed a custom Markdown Editor that enhances a Vuetify Text Input component with editing features optimal for authoring Markdown of developer content. @servicestack/editor is a developer-friendly Markdown Editor for Vuetify Apps which is optimized for GitHub Flavored Markdown where it supports popular IDE short-cuts for authoring code like tab un/indenting, single-line code and comments blocks, etc. See the Project Page for documented Example Usage of its features and how to make use of it within an existing component. @servicestack/images is a growing hand-picked curated collection of beautiful free images from unsplash.com that’s an easy drop-in to any Website, with backgrounds being served from GitHub’s CDN. heroes.js is a dependency-free script that returns different URLs to 2560x1000 /hero images ideal for usage in hero backgrounds. The Usage section on the project page contains additional examples showing how to use it within a static web page, a npm-based Web App using ES6/TypeScript as well as inside a React or Vue Component. The FileInput.vue is a simple single File Upload Component with an image preview. Inside your ServiceStack Service the uploaded file will be accessible from IRequest.Files collection with any additional arguments used to populate the Request DTO. If you’d also like to upload to Imgur you can copy the UploadToImgur extension in ImgurExtensions.cs into your project which includes image size validation as well as extracting any Imgur error responses into a readable C# Exception so it displays the cause of any downstream Imgur Upload Error in your UI.